Barrel Butte is the overall third steepest publicly accessible summit in Nebraska, according to measurements by the National Elevation Dataset. The western side lies on national forest land, while the eastern side is part of the Bighorn Wildlife Management Area. This is one of the most difficult public summits in the state, and should not be attempted by inexperienced hikers and scramblers. The west faces of the two main rock buttresses are almost completely vertical. The rock composition is soft and somewhat crumbly, making a technical climb out of the question. The northern buttress is slightly higher than the southern one. The east side offers the only possible route to the summit. If you explore the thick forest and canyon area on the southern parts, you may encounter wreckage from a GP Express Cessna passenger plane that crashed there in 1987, plus in a separate crash, a small private plane that hit the west face of the summit with enough force that part of it was thrown over the ridge to the other side. The wreckage of both planes remained largely obscured until the great fires of 2012 destroyed most of the forest there. The destruction caused by those fires and the resulting snag hazards has made hiking and climbing at Barrel Butte a matter of care and caution. 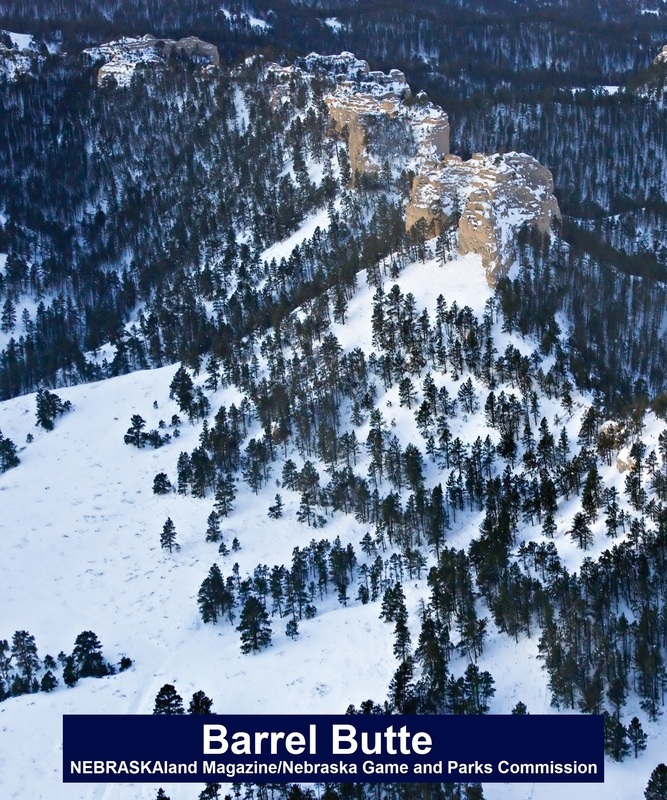 To hike the to the east side of Barrel Butte, travel 9 miles west from Chadron on Highway 20. Turn south on Eleson Road and follow it south for 9 miles, until you get to Bethel Loop Road. Follow Bethel Loop Road for 2.8 miles to the entrance road for the Bighorn Wildlife Management Area. If you are traveling from Crawford to the Bighorn WMA, drive east 2 miles on Highway 20 to Bethel Road. Drive 9.6 miles to Bethel Loop Road and turn there. It’s about 1.5 miles to the Bighorn WMA. From whichever route you use to drive to the Bighorn WMA, follow the Bighorn road to the parking area. From there, it’s all on foot. To hike to the west side of Barrel Butte, travel west from Chadron on Highway 20, just over 17 miles, then turn south on Hartman Road. From Crawford, drive east about 7 on Highway 20 to reach Hartman Road. Once you are on Hartman Road, go south 3 ½ miles, then turn east on West Ash Road and follow it for about 2.8 miles (it will curve to the south). You should be just to the west of Barrel Butte. Since no vehicles are allowed on forest service land, you will need to find a safe place to part just off West Ash Road.